Binding material for casting mold materials, consisting of chemical compounds of metals and/or non-metals, e.g. water glass (sodium silicate) Na2O · xSiO2 · yH2O, bentonite (montmorillonite) Al2O3 · 4SiO2 · H2O, kaolinite Al2O3 · 2SiO2 · 2H2O or cement (CaO)3 · SiO2. Water glass has a very long history as a binding material and is used successfully in many processes, whether in core production with CO2 or in the area of molding with esters as catalysts. However, cores and molds which are produced using this process possess properties which are not compatible with today’s process requirements: A low level of strength, low flowability, moderate disintegration properties and a limited degree of re-usability of the regenerated used sand are the main reasons why this system could not stand up to its organic competitors. Many of these disadvantages have now been removed by adjusting the mold material mixture and changing the process parameters (Hüttenes-Albertus Chemische Werke GmbH). In this way, through the addition of special additives (so-called promoters) and through thermal hardening instead of gassing with CO2, a level of strength is achieved which is comparable with the organic cores. 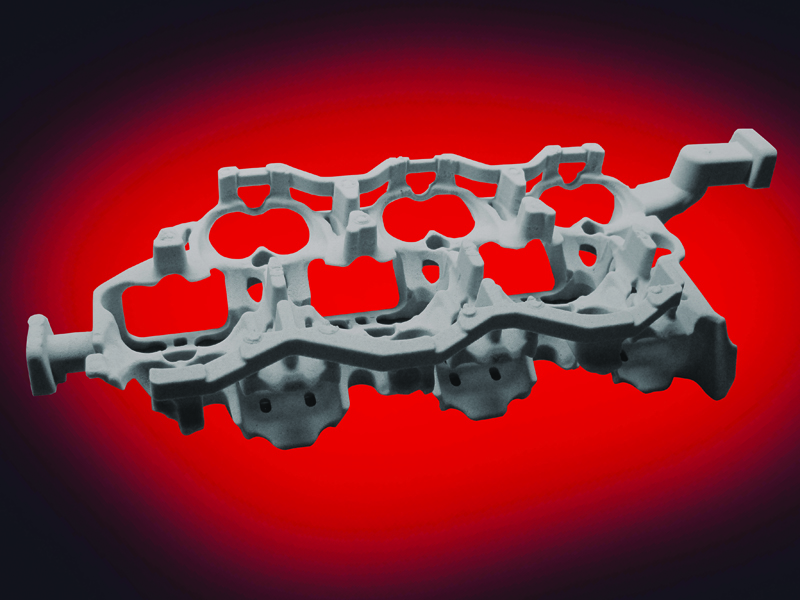 An improved flowability of the binding material makes it possible to produce complicated shapes, such as delicate water jackets, whose casting without dimensional variations is ensured by the thermal stability of the binder. For example, in the INOTEC binding materials (Figure 1, trademark of ASK Chemicals), the promoter acts as an additional network-forming component. 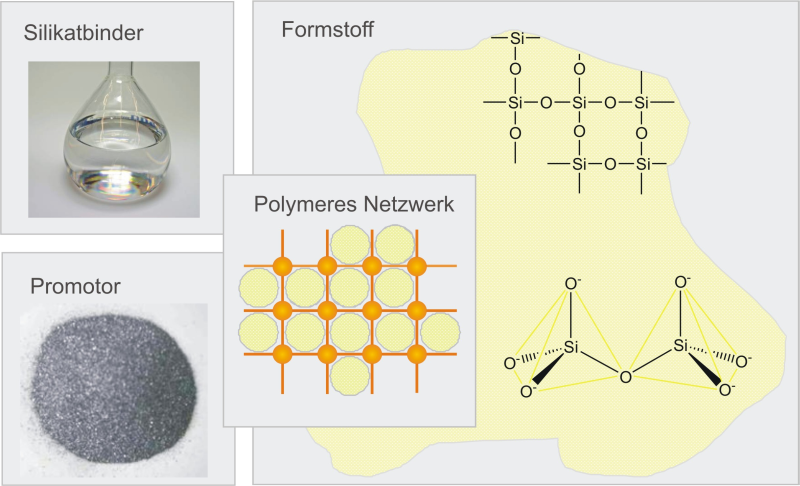 As shown in Figure 2, the promoter binds the individual particles together via the reactive groups and creates a silicate framework as a three-dimensional network. This means that the binder is then able to bind the grains of sand together very quickly and keep them in shape. Without the addition of the promoter, the network forms very slowly during the later hardening; the sand cores then display considerable disadvantages, such as lower immediate strength and a lower moisture stability. The process of thermal hardening is initiated via the introduction of heat through heatable core boxes and hot air flushing. In core production, a marginal shell is then formed on the core depending on the use of the hot tool. Through the use of hot scavenging air, both the water present in the binder as a solvent and the water which is released during the hardening at each stage of the reaction are expelled from the core. The chemical equilibrium is shifted towards molecule enlargement and the reaction is sped up overall. Depending on the cycle time and the flow rate of the scavenging air, there are areas inside the core which are not hardened which must be hardened later after the corehardening. This effect can already be observed in the water glass CO2process. Here, with increasing CO2gassing times, the strength values also increase initially; after a certain point these values sink again depending on the gassing time as the binder framework loses its gel structure and therefore its network properties. A similar phenomenon can be observed for any extension of the cycle time. The core binder no longer hardens after a certain point; the values of the long-term strength can even sink below the immediate strength. It is clear that the strength curve for the core binder and the storage stability of the sand cores are influenced significantly by the setting of the core production parameters.